OSWEGO – Certified Instructors at Bishop’s Commons in Oswego will again lead the popular weekly class designed to help participants improve their balance and avoid falls. Registration for the next “6 Steps To Better Balance” Class is now open. 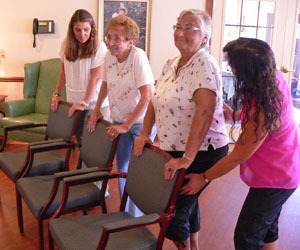 Pictured (from left) are certified instructor Cheryl Cullinan with Mary Regan and Dorothy Templeton as they practice a balance exercise, while instructor Norene Powers looks on. The “6 Steps To Better Balance” class; a six-step approach to Better Balance was developed by Betty Perkins-Carpenter, Ph.D., Senior Fitness Productions. The “6 Steps To Better Balance” class will be led by Certified Better Balance program instructors and will meet once a week beginning October 20 and continue through November 24. Classes will run from 1 to 3 p.m. each week. As a member of the Oswego County Falls Prevention Coalition, Bishop’s Commons will make this six session class and accompanying instructional material available free of charge to class participants. Registration is required and space in the class is limited. To register for the class, or for more information about the “6 Steps to Better Balance” program, please call (315) 349-0799 or (315) 592-0827. The Center for Disease Control and Prevention notes that one out of three older adults (aged 65 or older) experiences a fall each year. Falls are a leading cause of both fatal and non-fatal injuries and many may be preventable. The Six-Step Balance System is a powerful yet simple program. The program is designed to help individuals prevent falls by practicing and repeating a series of movements and simple exercises regularly. Bishop’s Commons is located at 4 Burkle St., on the St. Luke healthcare campus in the city of Oswego. About the Oswego County Falls Prevention Coalition: The Oswego County Falls Prevention Coalition is a multi-agency initiative committed to working together to measurably reduce the instances of falls and falls-related injuries in Oswego County residents.